To Fishbeck, Thompson, Carr & Huber, Inc. (FTCH), sustainability refers to the ongoing effort to balance the use of our planet’s resources with nature’s ability to continue regenerating them. This stems from the realization that our air, land, and water are valuable, limited assets that must be managed wisely to ensure they will be available to future generations. And FTCH doesn’t just say they believe in sustainable design; they show it. Their headquarters in Grand Rapids was Gold certified under USGBC’s LEED for Existing Buildings (LEED-EB) rating system in 2011. The certification was based on green operations and management practices, including areas they’ve addressed, such as: green site and building exterior management; water-efficient landscaping; commissioning electrical and HVAC systems; 20% annual energy reduction; purchasing sustainable office equipment, paper, furniture, supplies, and building materials; and reducing water consumption utilizing low-flow plumbing fixtures, to name a few. As a consulting company, both the need and the drivers for alignment and cross-pollination of ideas on sustainability are built into their daily work process. 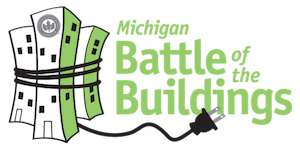 Since FTCH continually strives to reduce their carbon footprint and remain committed to responsible environmental stewardship, the company joined the Michigan USGBC Battle of the Buildings (BOTB) Program because it fit well with their energy reduction goals. According to Zoeteman, it also allowed FTCH to showcase their specialized areas of existing building commissioning (EBCx) and energy auditing. As a result of their participation in BOTB, FTCH instituted changes to the building systems and, perhaps more importantly, implemented simple operational and behavior modifications that help to substantially reduce their overall energy consumption. This included changes to their HVAC equipment and lighting fixtures to improve efficiency, in addition to something as simple as encouraging staff to make sure lights were off when leaving an office or conference room. “Participating in the BOTB program has helped to re-energize these efforts among staff and reaffirm the importance of our ongoing commitment toward sustainability,” Zoeteman said. FTCH will use the excitement of receiving the Office category award in the 2014 BOTB program to push forward with several exciting projects in 2015 and beyond. According to Zoeteman, FTCH is currently developing plans for a large university housing project and a new academic laboratory building in West Michigan, and is the LEED Administrator on a Southeast Michigan project that is proposed to be one of the first LEED-NC v4 projects in the world. “We feel lucky to have so many clients willing to go the extra yard by engaging FTCH in the multi-discipline development of large-scale energy efficient LEED projects,” Zoeteman said.